I am all about demystifying, unwrapping, and otherwise obsessing about one ingredient at a time. In this case, kiwi has bubbled to the top of my brain. My husband actually text-ed me kiwi facts while taxi-ing on the tarmac one afternoon; apparently, he had read a compelling article on the many and varied health benefits of kiwi. Soon after, the California Kiwi Commission contacted me, and shared all sorts of tidbits of information about the kiwi fruit. The California Kiwi Commission---whom I now love---sent me a box of kiwi. If I were to open up a box of kiwi on Christmas morning: I would shriek with happiness. Christmas morning aside: I am giddy. Now, with a big box of kiwi, I am all teed up to explore the finite benefits of this increasingly popular fruit. I didn't grow up eating kiwi, and for many years wasn't sure about the strawberry-banana-like flavor. The primary fruits of my youth were apples, bananas and oranges. Seasonally, we ate strawberries and blackberries, watermelon and grapes. But not kiwi. Now? I have a kiwi almost every day. I slice it in half, snag a spoon and scoop a few bites of green flesh into my mouth. When we, as a family, cycled from Amsterdam to Paris the summer of 2010, we stayed overnight at quite a few bed and breakfasts---and in people's homes (with a bit of research, we found homes where people rented out a room or two, provided lock-up for our bikes plus breakfast). It was on that memorable ride that we all noticed kiwi. It was at almost every hotel, every bed and breakfast and every home. Our impression: people in Europe ate a lot of kiwifruit. I didn't start reaching for it until about halfway through our trip. I think it was because I figured you had to peel it and it would make a mess... too much effort. But somewhere along the way I saw people slicing it in half and diving in with a spoon. You could almost pop it into an egg cup: same concept. Kiwi is now a part of our daily lives; my sons eat kiwi all the time. And the very best news of all? We discovered a few kiwi trees in our neighborhood; you can grow kiwi in Washington State! We already have plans to plant a kiwi tree in our very own yard. 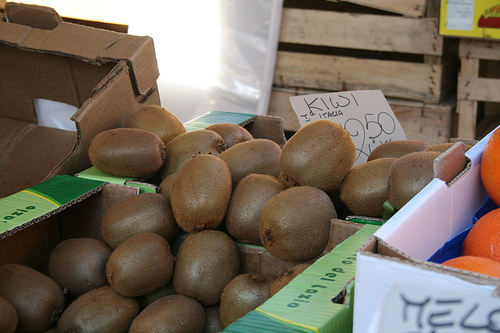 Name: kiwifruit earned its namesake “kiwi” from a flightless, brown and fuzzy bird. Grows when/where: kiwi fruit is a major crop in New Zealand and California. The California crop is available from October through May; the New Zealand crop from June to October. Serving suggestions: Add raw kiwi to fresh fruit compotes and salads or serve it with avocado, radicchio, endive just as you would oranges. Quick take on nutrition: Vitamin C and E, more potassium than a banana, antioxidant, magnesium, zinc, folate, etc. Woohoo! Get your free 'SLOOPER' (kiwi-eating tool) from the Kiwi Commission. Jul 14 flour 101: amount of protein and why it matters.